Urgent foster support needed for large scale rescue! 300 rabbits were confiscated from a breeder in the Sacramento area last month. Now, these rabbits have seen a vet, received evaluation and proper care and have been housed well. But the shelter cannot keep such a large number of rabbits. Many left last week, now 65 of the confiscated rabbits are available for rescue. We need to help these little ones. The Rabbit Haven has agreed to take in 10 to 20 of these amazing rabbits. The shelter simply has no room for such a large overflow of rabbits to stay longer at their facility. Please help. 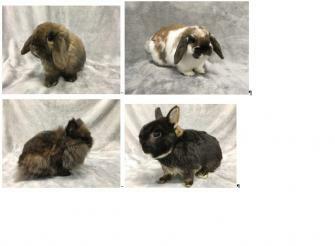 These rabbits are so sweet and now in need of loving foster care then permanent homes. HRS and the SHRS already took in 10 rabbits and now The Rabbit Haven plans to take 10-20 of the 65 remaining. We need foster support to help move the rabbits from the shelter into loving foster homes (like yours). We hope to pick up at the latest by Wednesday 4-11th. All set up supplies will be provided and we truly need your help asap–this week- Call Monday if possible 831 239-7119 and email director@therabbithaven.org.